miniBIGS Minifig Blog: LEGO Collectible Minifigures Series 10 - Coming Soon! 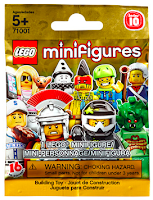 LEGO Collectible Minifigures Series 10 - Coming Soon! "With 17 all-new, special minifigures in Series 10, the LEGO® Minifigure Collection continues to grow. Each minifigure comes in a sealed 'mystery' bag with its own special accessories, display plate and collecto r's leaflet. Inspired by movies, sports, history and just everyday life, this collection includes: Warrior Woman, Decorator, Sad Clown, Roman Commander, Bumblebee Girl, Motorcycle Mechanic, Grandpa, Revolutionary Soldier, Baseball Fielder, Librarian , Sea Captain, Medusa, Skydiver, Trendsetter, Paintball Player, and Tomahawk Warrior." Word on the street is that the Exclusive Mr. Gold Minifigure is super limited edition and only 5000 were made. I must have one!